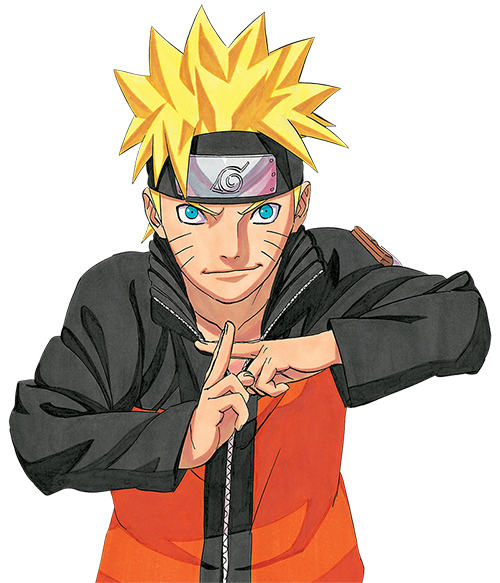 VIZ | Blog / A Manga That Proves 2+1 = Fun! 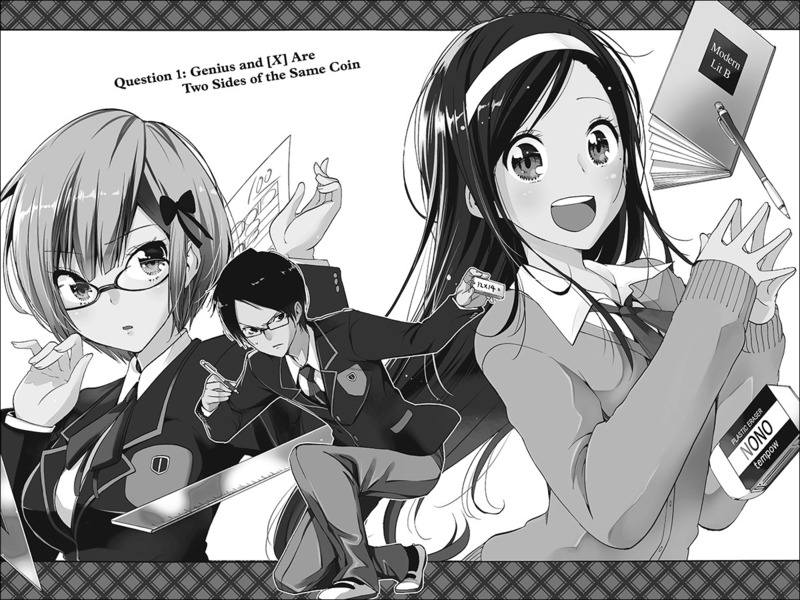 A Manga That Proves 2+1 = Fun! We Never Learn, Vol. 1 is a tender rom-com where love is never academic! Editor's Sidebar: Where we hear directly from VIZ editors about series they're currently working on. Taishi Tsutsui's We Never Learn is a stand-out entry in the current line-up of Weekly Shonen Jump, and it's easy to see why. Tsutsui's art is super energetic, and when it comes to romantic comedies, he definitely knows how to create the perfect situation for awkward, tender, or touching hijinks. 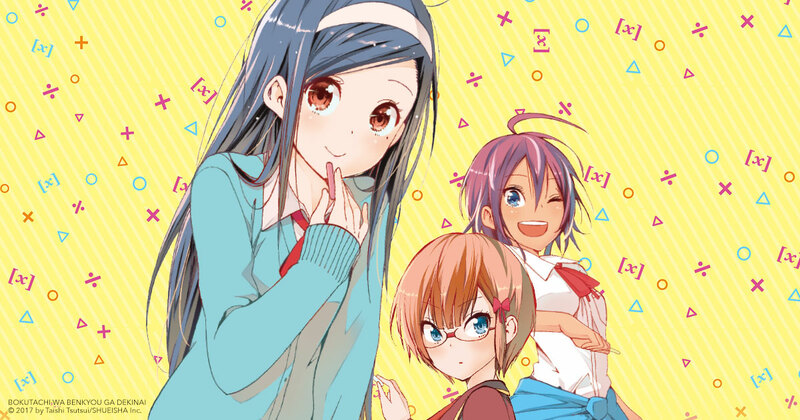 A young man, Nariyuki Yuiga, must tutor teen geniuses Rizu Ogata and Fumino Furuhashi in the subjects they're weakest at in order to secure a special recommendation for college. Yuiga is dirt poor and eagerly agrees to the assignment, only to find that the girls aren't just weak in their respective subjects...they're almost hopeless! He's got to earn their trust, turn their grades around, and deal with the flood of teenage romantic antics that inevitably rise up. 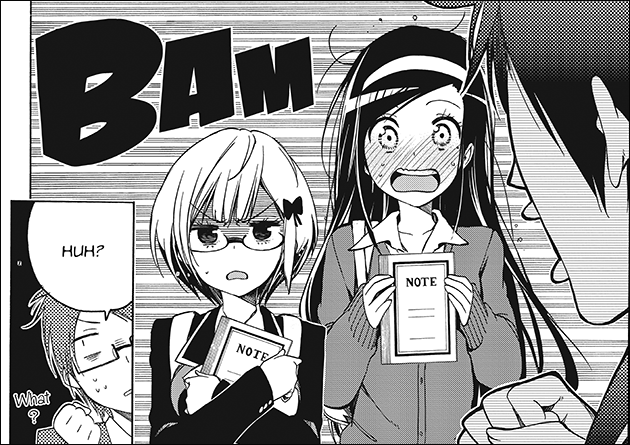 We Never Learn is making the leap from Weekly Shonen Jump to graphic novels this month (available in print and digital), so let me tell you two things to pay attention to after you pick it up. The cast of We Never Learn are close to graduating high school but still young, and you can see it in their actions. Crushes and romantic interests come in hot and heavy, but the cast is too new to dating and too shy to just open up about their feelings. They all dodge the truth in different ways—one character likes to ask about romantic stuff for her "friend," another is patient and chooses to sacrifice so that others can explore their crush, and yet another is utterly clueless, but knows enough about romance to feel embarrassed when she falls face-first into romantic situations. All of the cast are very different from each other, and each of the girls in particular approaches their lives (and loves!) in different ways. That difference is where the magic happens, when simple jokes become incredibly funny and innocent encounters lead to a flood of blushing, surprised faces. Speaking of faces...one thing We Never Learn shares with its fellow Shonen Jump hit Nisekoi is great art. Tsutsui is particularly good at a couple of things—facial expressions and physical comedy. 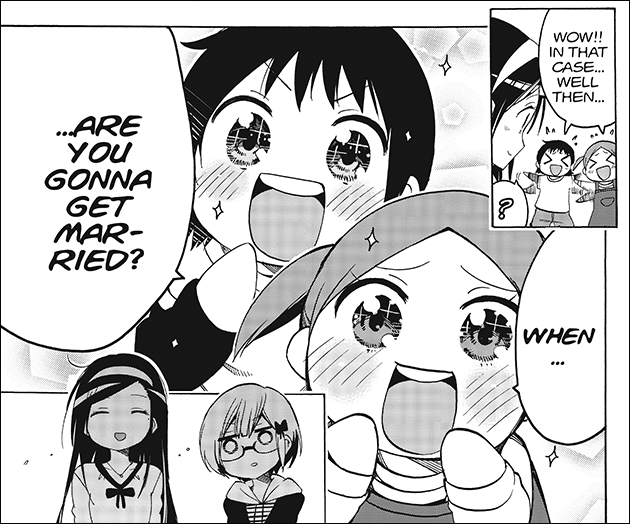 Romantic comedies always have a moment where the main character ends up accidentally entangled or stuck in an awkward position with one of the ladies in the series, and We Never Learn definitely hits that mark. At the same time, Tsutsui doesn't lean on the usual complement of accidentally suggestive encounters. People hold hands in dark rooms, exchange kisses while falling, and sometimes just end up stuck together in a small space. Tsutsui nails it every time, whether he's going for a joke or a touching moment. Tsutsui's facial expressions are magic, too. Rizu Ogata, for instance, is remarkably expressive. Over the course of the first volume, we see her look fearful, happy, smug, petty, embarrassed, determined, and even more beyond those. Every face is unique, instantly recognizable, and super-cute. You learn a lot about who Rizu is by the faces she makes, which is something I love. The same is true of the rest of the cast, too. Everyone has their own little touches, aspects, and tics that tell you exactly who they are just by how they look. That's a hallmark of great manga to me. 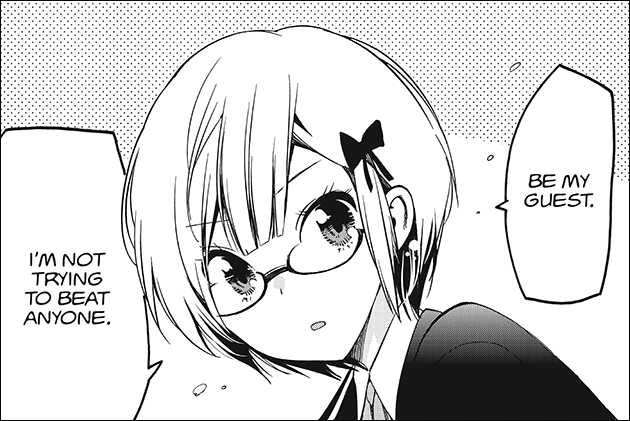 We Never Learn's first volume introduces us to the cast and eases us into the storyline. With each new volume, Tsutsui's art gets even better, elevating the jokes and storytelling to new heights. School festivals, swim practice, study sessions, and more become excellent cauldrons for mixing romance and comedy into a perfect mix, evenly balanced and laugh-out-loud funny. 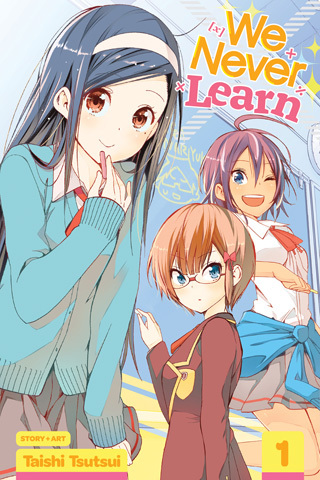 Read a free preview of We Never Learn here.